Exam Table Paper Stand by Medline Canada is designed to protect exam papers from debris and moisture while providing protection to patients. 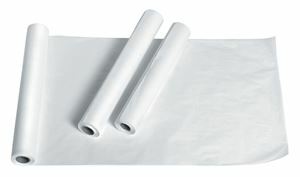 Crepe material used to make exam paper stand is soft and has good level of absorbency. Crepe has a texture that keeps the surfaces from sliding. Poly bagged for cleanliness at the time of shipment. Available in 18"x125 and 18"x225.